How can engineers help combat oyster poaching threatening the Chesapeake Bay? Aid the recovery of physically impaired stroke survivors? Provide light to the 1.2 billion people worldwide without reliable electricity? 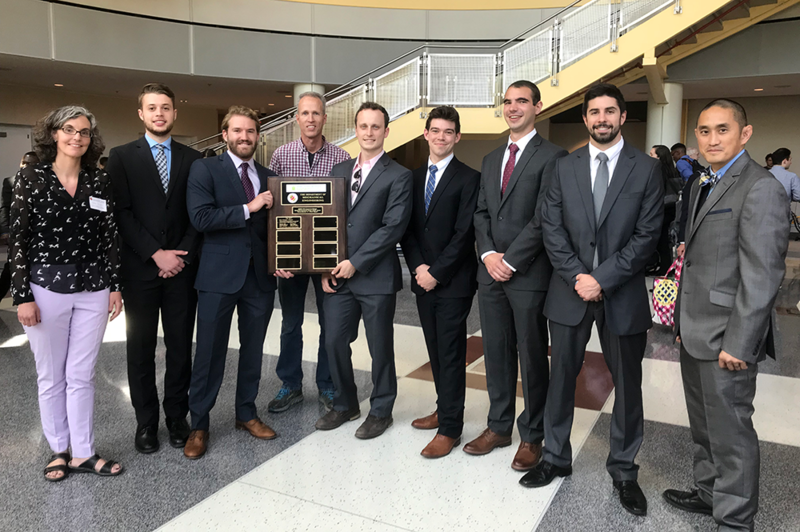 Mechanical engineering students presented solutions to these problems and more on May 8 at the Department of Mechanical Engineering’s Spring 2018 Design Day, a semesterly event that highlights the innovative design strategies and product development of seniors in ENME 472: Integrated Product and Process Development. Students showcased their semester-in-the-making design concepts and prototypes to other students, faculty, staff, and community members who joined for the event, while alumni and corporate representatives participated as volunteer judges. The large range of possibilities within mechanical engineering was seen in the variety of projects, including safety features for construction workers, devices to aid the blind or patients recovering from strokes, alternative power sources for developing nations, small modular nuclear reactors, and advanced sporting equipment for amature athletes. One project that stood out thanks to its relevance and applicability to a notable Maryland-area estuary was team Oyster Boys’ dredge-detecting device. Oyster farms and sanctuaries are at high risk for oyster theft, a threat detrimental to the health of the Chesapeake Bay. Oysters are natural filter feeders, meaning they feed by pumping water through their gills and, in turn, push out cleaner water. According to the Oyster Boys’ research, $1.5 million of tax-paying dollars are used to repopulate the Chesapeake Bay’s oyster sanctuaries, only for 80% of those oysters to be stolen through dredging. Their solution: Bay Watcher. Winner of Design Day’s Sustainability Award, the Bay Watcher prototype is a beacon capable of listening for the sound of dredging and, upon detecting that specific sound, alerting the necessary authorities to this illegal and destructive practice. Having tested their latest prototype in the Chesapeake Bay, the Oyster Boys created Bay Watcher using hydrophones, electronic systems, and 3D printing done in Terrapin Works’ MakerBot Innovation Center. With the goal of saving so many oysters, an imperative member to the bay’s ecosystem, Bay Watcher has the potential to create serious impact on Maryland’s unique ecological community. The Oyster Boys team is made up of six mechanical engineering majors graduating in Spring 2018: Noah Todd, Kyle Thibeault, Noah Suttner, Chris Buckley, Patrick O'shea, and Steve Powers. Though the Sustainability Award was chosen by a group of distinguished judges, participants of the day’s event were able to cast their own votes for the People’s Choice Award. First place winner of the People’s Choice Award was the ReStruders, who created a product that recycles used PLA, or polylactic acid, and extrudes it into repurposed filament for 3D printing. Team UCA placed second with their Universal Cart Assist, which aids individuals lifting heavy or bulky items into and out of their shopping carts. Super Sluggers won third place for their electromechanical batting tee, an all-ages baseball training device that places a baseball in a user-specified strike zone location. The range and scope of this semester’s Design Day projects was reflected in the versatility of the award winners’ products, which hone in on innovative design, user need, and impact—all product development strategies that will guide Clark School mechanical engineering graduates as they continue their work beyond the university.